If you missed the fifth RAR National Conference 2018, you missed a treat. RAR Patron, Professor Gillian Triggs called for An Australian Bill of Rights, and took time out to speak to a child on Nauru. The Conference finished on a colourful and vibrant note … leaving us all wanting more. 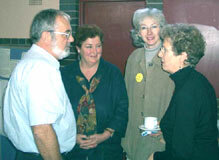 On 7 and 8 December 2002 in Mudgee NSW, Rural Australians for Refugees had its first National Conference. Dear All – especially those who couldn’t make it to Mudgee! The first annual RAR Get-Together was a fabulous event, successful beyond our wildest dreams. We all went home energized, excited – and tired out from an intense and fulfilling day-and-a-half together. Our heartfelt thanks to Mudgee RAR who dreamed up the idea, midwifed it and then staged the actual event without a flaw. And thank you to the 150 plus participants who turned up from as far afield as Narrogin in WA, Goodiwindi in Queensland and Port Augusta in SA, and a couple of dozen RARs in between. The third RAR National Gathering 19-20 March 2005 was in Bundanoon. The conference was organised by a small group of Southern Highlands RAR members. The weekend started on Friday night with drinks at the “Keil-na-nain”, the home of Anne Coombs and Susan Varga. As well as all the areas RAR has been so far involved in we need to seriously consider helping to create employment for refugees, plugging into rural economic development for rural areas and expanding the welcome towns and welcome weekends concepts. Another area to explore is the creation of educational opportunities for refugees in rural Australia – through TAFE system and other education sectors ie opportunity for skills development. Move on from fruit picking to more substantial training. Continuing to educate the community seems to be another priority, with the Shepparton example of outreaching to Rotary clubs etc to tap into existing community groups. This conference aimed to re-unite refugee advocates across the country, and to discuss practical strategies of joining forces across regional Australia to combat the horrific language our political parties have used to try and sweep the issue under the carpet. Former Bendigo Advertiser journalist Ben Doherty – now with the Guardian Australia – Nick Olle of The Project, barrister and Patron of RAR Julian Burnside, Pamela Curr of the Asylum Seeker Resource Centre and refugee poet Hani Abdile were among the guest speakers at the national Rural Australians for Refugees’ One Voice; One Vision conference in Bendigo. The 2016 Conference was a reaffirmation of Rural Australians for Refugees as a national grassroots network.